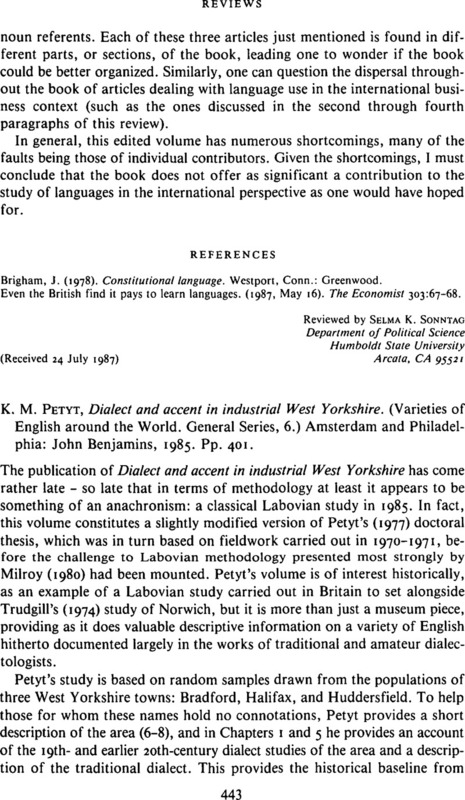 K. M. Petyt, Dialect and accent in industrial West Yorkshire. (Varieties of English around the World. General Series, 6.) Amsterdam and Philadelphia: John Benjamins, 1985. Pp. 401. Labov, W. (1966). The social stratification of English in New York City. Washington, DC: Center for Applied Linguistics. Macaulay, R. K. S. (1978). Variation and consistency in Glaswegian English. In Trudgill, P. (ed. ), Sociolinguistic patterns in British English. London: Edward Arnold. Milroy, L. (1980). Language and social networks. Oxford: Blackwell. Petyt, K. M. (1977). Dialect and accent in industrial West Yorkshire. Unpublished Ph. D. thesis, University of Reading. Petyt, K. M. (1978). Secondary contractions in West Yorkshire negatives. In Trudgill, P. (ed. ), Sociolinguistic patterns in British English. London: Edward Arnold. Trudgill, P. (1974). The social differentiation of English in Norwich. Cambridge: Cambridge University Press. Trudgill, P. (1986). On the validity of the apparent time paradigm: Norwich revisited. Paper presented to the Sociolinguistics Symposium, University of Newcastle upon Tyne.